McFarland & Company, 9780786468324, 228pp. 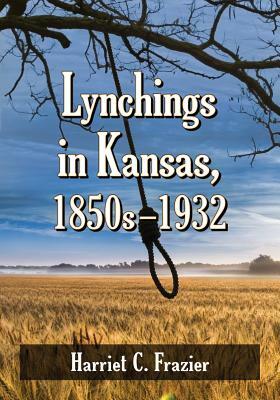 In 1933, Genevieve Yost, Kansas State Historical Society cataloger, published a "History of Lynching in Kansas." The present book is a development of that work, researched with the benefit of modern technology. The author locates 58 lynchings Yost missed and removes 19 from her list that for various reasons are not lynchings in Kansas. Yost apparently catalogued her 123 entries, some containing up to six names, based on her newspaper sources' headlines, not the actual stories on the lynchings. Her catalog places some events in counties that did not exist at the time of the lynching. In this book, errors in her data are corrected: misspelled names, incorrect places and dates, and the number of victims per incident. In agreement with Yost, the author finds that most of the victims were white men who were horse thieves, their deaths taking place in the eastern tier of counties bordering Missouri, an area then and now where most Kansans lived. The last lynching in Kansas took place in 1932 in the extreme northwest of the state, and an interview of an eyewitness is included. Harriet C. Frazier, attorney and retired law professor in the Criminal Justice Department at University of Central Missouri, also has a Ph.D. in English. She lives in Missouri.